In a span of ten years, the population increase in Rogersville, Missouri, has outpaced the national average by 95 percent. With a population that has doubled, the need for infrastructure improvements is critical. For a long time, US 60, a major expressway that runs between Rogersville and Springfield, served travelers and local motorists in southern Missouri with signalization controlling traffic flow. Over time, however, the Missouri Department of Transportation (MoDOT) has recognized the need to lessen the stop-and-go and enhance safety. When the agency decided to convert the arterial into an access-controlled freeway to improve mobility and safety, the Radmacher Brothers/RS&H team had the right solution. Our team’s design overcame the risks associated with converting an expressway to a freeway, such as creating physical divisions in communities, displacing homes and businesses that define areas, and impacting the local environment. In fact, as evident in the visualization, we met these challenges and our design solution is a dramatic improvement for local travelers, through-traffic, and pedestrians. The Radmacher Brothers/RS&H team won the privilege of designing and constructing the project by providing the highest value and best innovations while meeting MoDOT’s fixed-price budget. MoDOT’s goals included eliminating at-grade intersections and traffic signals at a junction with US 60. Now under construction, the freeway will provide three points of controlled access to the City of Rogersville from Greene and Webster Counties. It will facilitate safe movement of vehicles along the US 60 corridor, as well as efficient circulation of vehicles and pedestrians throughout the city. Project elements also include roundabout traffic control geometrics and various other improvements and additions to the local road network that will stimulate economic development and regional growth. These enhancements include new interchanges, two-way backage roads, reconfigured and improved intersections, and new turn lanes. Accommodating for future growth is a primary goal of the US 60 freeway project, ensuring the community has the ability to sustain the type of growth it has seen in the past. To meet this goal, RS&H used innovative intersection design for safety, preparing the area for increases in traffic volume. The project features two unique interchanges that utilize roundabouts: a barbell roundabout and a dogbone-shaped roundabout, both of which will accommodate future growth. Roundabouts are an effective design commonly used in Europe and are gaining popularity in the US. They provide safety advantages by preventing T-bone crashes, and they are more sustainable because they avoid signalization, use less material, and require less upkeep. 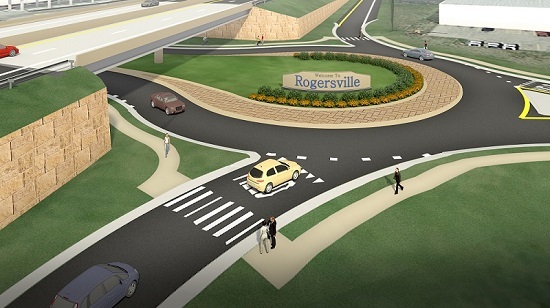 In addition to the more obvious benefits, such as increased circulation and traffic capacity, the use of roundabouts also created an opportunity for new signage, more landscaping, and aesthetic features, creating a gateway feature that welcomes travelers to the Rogersville area. Elements of RS&H’s design support the economic and societal wellness of the community. Along with the converted roadway and two new interchanges, our design proposed a third bridge to sustain community connectivity and maintain traffic flow. Another feature was the incorporation of double-sided backage roads. Like frontage roads, backage roads are used to improve circulation, but are set back further from the main road with land on both sides. This allows for economic development along the roadway and also makes the project more appealing to local residents and businesses. For a project of this magnitude, keeping the public informed is imperative. RS&H took great pride in this objective and made a concerted effort to rally a positive public perception. The team used tactics, such as showing a looped video of the project developed by our visualization team at a highly attended public meeting. The crowd was impressed by the video, which helped them to better understand the scope of the improvements and, ultimately, limited opposition to the project. A further commitment to the community, the project team also partnered with local schools and colleges to engage budding engineers for educational and public relations purposes. The department administers a Diversity Outreach Program that cultivates young women’s knowledge about engineering and engineering careers. The program immerses young women in significant projects, exposes them to the broad spectrum of engineering career choices, and educates them about the breadth of their future opportunities. Our team helped to coordinate this effort and identified a qualified subconsultant to run the program. The project has progressed successfully with RS&H coordinating closely with the contractor and other professionals. The project team has instituted a collocation arrangement in which consultants, contractors, and MoDOT are working together to ensure project success.